This training program, free for veterans, military service members and spouses, incorporates research-based self-regulation techniques and technology. Learn to manage emotions, build resilience and improve performance and decision-making. Retired Army Maj. Robert A. Bradley and HMI’s Rollin McCraty Ph.D. discuss the challenges facing veterans and current military personnel. Veterans tell how HeartMath helped them. 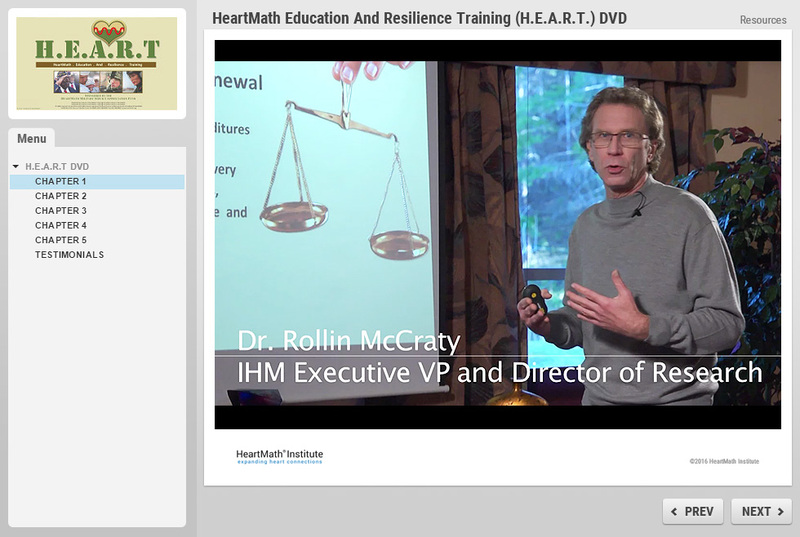 HeartMath Education And Resilience Training (H.E.A.R.T.) program is now available online for veterans, current service members and their families. The H.E.A.R.T. DVD and booklet program has reached 8,000 individuals. It is our hope the online H.E.A.R.T. will now reach thousands more. To receive the H.E.A.R.T. DVD, Click Here. To receive access to the Online H.E.A.R.T. Program, Click Here. Daily routines erode your resiliency, that unique ability to hold up and bounce back from life’s challenges. Whether it’s you or your spouse who is currently serving, in transition or finished with military duty, recharge your energy and resiliency with a few simple science-based techniques in only minutes a day. Receive a free copy of Resilience and the Emotional Landscape. Visit Our Veterans and Military Service People section to read articles on various topics related to those who are serving or formerly were with the Armed Forces. Among the topics are the stresses and challenges of military life, PTSD, special training and programs. Search HMI Blog. Rollin McCraty explains the importance of positive emotions and the dynamics of resilience, energy expenditure and energy recovery. McCraty, a leading researcher of heart intelligence and the physiology of emotions, offers tips for building and maintaining resilient energy to help improve performance and health. Click to View or Download. Learn about HeartMath’s many free resources, exclusive offers and tips for service members, veterans and their families by visiting the Facebook for HeartMath Troops, Veterans, Families Page, where you can connect with, honor and support them. Join the conversation! HeartMath Troops, Veterans and Their Families. What causes you stress in your life? This short scientific survey objectively assesses the state of your heart, mind and emotions and provides critical information you can use to build and maintain resilience and optimal health. You will be asked the right questions and then receive a practical and simple regimen for achieving your goals. Take the survey. 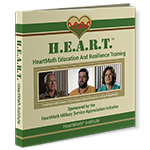 In appreciation of your service, the HeartMath Institute is pleased to offer military service members, veterans and their families a 30% discount on all products in the HMI Web Store. To receive the discount code, email us at info@heartmath.org or call (800) 711-6221. HMI provides programs, tools, technology and services to active-duty military, veterans and their families through its Military Service Appreciation Initiative. Care providers, social workers, veteran services facilities and military installations also are eligible. Learn more. Sponsorships are awarded to applicants in need of special care and aid. Previous awards have been given for emotion self-regulation training before and after deployment; military health clinics for active personnel; combat stress; PTSD; and research related to the effects of military service. Apply here for a Military Service Appreciation Initiative sponsorship. You Can Support service members and veterans by contributing to the Military Service Appreciation Initiative. Whether it’s for building emotional balance and resiliency before deployment, transitioning back home or continuing effects of service, your generous donation helps and honors someone in need. Donate now. Children frequently experience stress when Dad, Mom and sometimes both serve their country. HeartMath understands that the long absences from parents, frequent moves and a lifestyle different from their friends’ can be hard on children. We have many resources for military families with children. Visit the Heart Coherent Parenting.